Conservatives lambasting Justin Trudeau for discussing marijuana with students this week likely won't be happy that one of their own did the same thing in September. And, like Trudeau, Tory MP Scott Reid told those kids that pot should be legalized. According to The Frontenac News, Reid spoke to grade 10 students at Granite Ridge Education Centre on Sept. 17 about a range of topics. At one point, a debate ensued about Canada's pot laws. The students in favour of changing the laws were reportedly asked to sit in one section of the room, while those opposed were asked to sit in another. While the majority of students were strongly opposed, Reid sat with the pro-legalization crowd. Reid later told the crowd that he views drug policies in North America as illogical and inconsistent, Frontenac News reports. "I've never smoked marijuana, or cigarettes, but I favour legalization," Reid said. 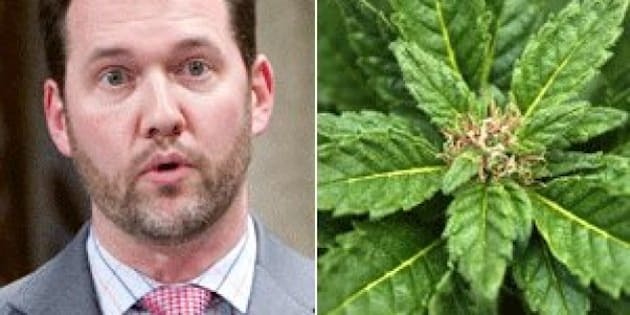 The MP also seemed to downplay the idea that marijuana is dangerous. "The most significant gateway drug is cigarettes, and the drug that does the most damage is alcohol, and they are both legal, and should be in my view," he said. Reid admitted his stance differs from the Conservative Party, which has toughened penalties for pot possession. "I was the only one in my party who voted against that legislation," he said. Reid's comments likely won't sit well with Justice Minister Peter MacKay who accused Trudeau of pushing pot on kids this week after the Liberal leader visited a Manitoba school. Trudeau was speaking to a crowd of Sioux Valley high school students and younger children on Wednesday when he was asked to explain his pot plan. The Liberal leader received applause when said he favours legalizing the drug so that it can be controlled and regulated, which he maintains will help keep it away from kids. MacKay released a statement Thursday ripping Trudeau for the "grossly inappropriate" comments to "elementary school children." "He's directly delivering a message to children now that recreational drug use is okay," the statement reads. "These drugs are illegal because of the dangerous effects they have on users and on society. We need to protect our children, not introduce them to harm." Conservatives also sent a fundraising email to supporters on the issue. But Trudeau hit back with a statement saying the students "applauded a politician with a message to stay off drugs" and that the current system is not working. "That the Conservatives would put out a statement condemning the courage showed by those students is shameful," it reads. "Peter MacKay should retract his statement." But Reid's stance on marijuana and Canada's drug laws is actually nothing new. In 2001, as a member of the Canadian Alliance, Reid wrote an essay comparing current marijuana laws to prohibition. "The distinction between legal and illegal substances is clearly arbitrary, and would seem to be based on nothing more substantial than the fact that some drugs have a long history in our culture and therefore are more socially acceptable than others," Reid wrote. The Tories have been critical of Trudeau since the Grit leader announced his support for pot legalization and told HuffPost Canada this past summer that he has smoked marijuana since becoming an MP in 2008. In his speech to Tory delegates earlier this month, Prime Minister Stephen Harper couldn't resist taking a shot at the Grit leader. "In 2015, we're not choosing the winner of 'Canadian Idol,' we're choosing someone to lead our economy," he said, to applause. "The only trade policy Justin Trudeau's been working on is the marijuana trade."